A simple village expansion for Whistling Mine. Moved all remaining NPC related edits to the AI control quest. Removed all direct NPC edits. Added USSEP as a requirement to support the changes since the unique NPC flags are needed. Ingots in front of Thorgar's house were clipped through the cart. The cart was also unrealistically upright. Moved AI changes into aliases to prevent other mods from needlessly overriding the new schedules. Fixed a missed water data setting. It always seemed odd to me that an established mine with an active smelter had no place for the people there to live. Whistling Mine is cold, and inhospitable. Nobody in their right mind would actually sleep there! 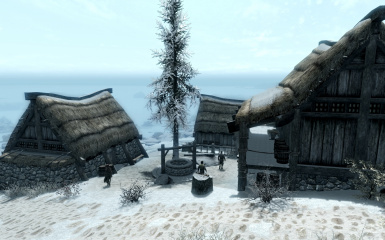 This mod solves that oddity by providing a small village for the 4 NPCs to live in and spend some time in. Cause who wants to spend their lives living in the mine they work in! 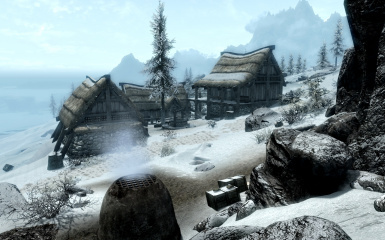 It was also somewhat strange that Winterhold Hold had nothing but a single half ruined town in it. 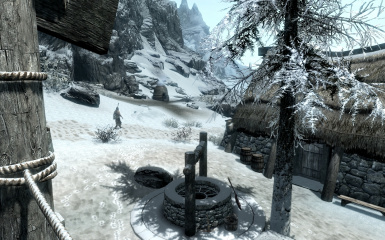 Unofficial Skyrim Special Edition Patch 4.1.5 or greater. Drop the Whistling Mine.esp, Whistling Mine.bsa, and Whistling Mine - Textures.bsa files into your Data folder. To remove the mod: Delete the Whistling Mine.esp, Whistling Mine.bsa, and Whistling Mine - Textures.bsa files from your Data folder. Then reload your game as usual. Will not be compatible with other mods that change the Whistling Mine exteriors.